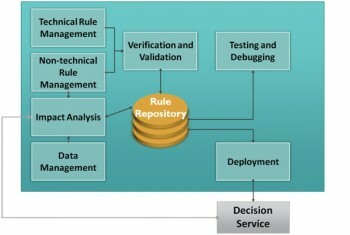 A typical first BRMS implementation starts by capturing their rules. Typically they interview experts, read policy manuals and reverse engineer code into rules. Almost always, but especially when they reverse engineer code, they end up with a lot of fairly low-level rules. In one, big, bucket. This big bucket of rules is not usable, not very re-usable, and difficult to maintain. As policies or regulations change, or as new business needs are identified, the team often struggles to update the right business rules. Decision Management resolves these issues. A BRMS generates a positive ROI when it improves business performance – the operational decisions that drive every single transaction. Decision Management simplifies business rules design and implementation while accelerating adoption of a BRMS where it has the highest impact. To learn more download our free white paper, or contact us for a free consultation.